Recipe: 1.5 oz vodka. 1 oz coffee liqueur; 1 oz cream. Shake and strain over fresh ice in a rocks glass. I like to think of the White Russian as the ultimate gateway cocktail. It certainly was for me, anyway. The White Russian was invented in the 1970s when liqueurs were very popular, like a coffee liqueur, and of course, as we all know, it was immortalized in the 1990s by Jeff Bridges. 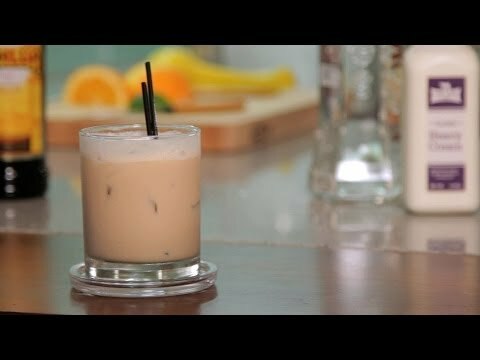 And even though it is a symbol of irony in the eyes of most people, the rules still apply when making a White Russian as they do with all cocktails, fresh, real ingredients. So we have real cream, vodka, no mix, none of that stuff. So let's start with our spirit, vodka. One and a half ounces and I've got two three-quarter ounce jiggers here. One ounce of cream. I'm using cream here, instead of milk because we are going to shake this, which will add some dilution to it. So cream is a little thicker, and I just want the drink to maintain that really rich, delicious viscosity, you know the kind of like dessert. Because let's face it, that's really what this is. This is really just an alcoholic dessert, a delightfully alcoholic dessert. Delightfully alcoholic and dangerous dessert. And one ounce of Kahlua. There is plenty of other coffee liqueur's out there. It doesn't have to be Kahlua. That's the most common one you're going to see through. And now I'm just going to grab my chilling rocks glass in the fridge. Okay, and as I said, I'm going to shake this, because there are cream and a lot of thick ingredients, we really want to force those ingredients to mix together and stay together and we can set up our ice in our glass, too. All right, let's do this. Okay, it smells the Cohen brothers. Okay, and that very simply is how you make a perfect White Russian.